A candid conversation with the eclectic patron, paternal saint of all things home-recorded & more—R. 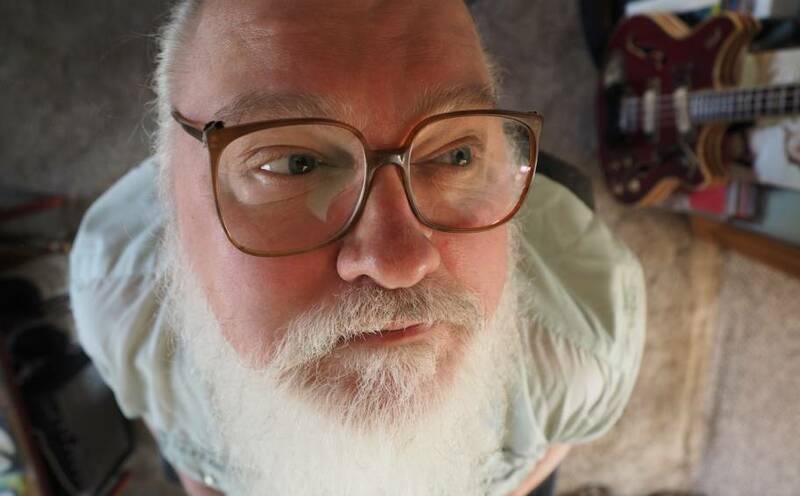 Stevie Moore; press photo appears courtesy of RSM/Happenin Records. Glasgow’s FVNERALS; press photo courtesy of the band. Glasgow’s FVNERALS just released their album Wounds today (via Golden Antenna Records EU / The Native Sound stateside) and we give you a listen to the goth cathedral interiors & atmospheres that abound, complete with a track-by-track break down from the band. “Void” sets the tone & mood as you enter the Glasgow trio’s citadel of sound. The title track burns slowly like a mourning candle, as “Shiver” creates a sense of church organ sanctuary from the outside threat of the surrounding winter cold. “Teeth” gnashes with a devotional sense, where “Crown” feels as if you are being privy to a coronation made in secret. “Antlers” is the sound of uncovering some kind of spell that would have been better kept under wraps, while the closing epic “Where” will have you holding on to every echoing key as you ponder what directions Tiffany, Syd & Chris will take next. Read their exclusive notes on each track off Wounds immediately after the following listen. We wrote the album as a way to deal with our personal demons, our every day struggle with chronic depression, isolation, lethargy and anxiety. We tried to build “Wounds” as a journey through existence, tainted by sadness, each song building to the next while keeping its own emotional catharsis. Writing this album brought a lot of emotions out of the both of us, which made it quite difficult and overwhelming at times but probably also added an emotional heaviness and bleak fragility to the songs. We wrote a lot of material but only kept what we felt benefited the album as a whole rather than making a collection of individual tracks. When we wrote the song I was trying to build a strong contrast, going from an elegiac monotone opening to a thundering descent into hopelessness. Tiffany wrote lyrics about the loss of someone close, their omnipresence and being unable to move on.